Tertiary study never comes cheaply, especially if the student needs to live away from the family home. Accommodation costs usually mean that the student needs to work in order to help cover costs. The objective of this project was to reduce student accommodation costs by at least 50%. Lower housing costs would allow a student to focus more on study than on generating income. 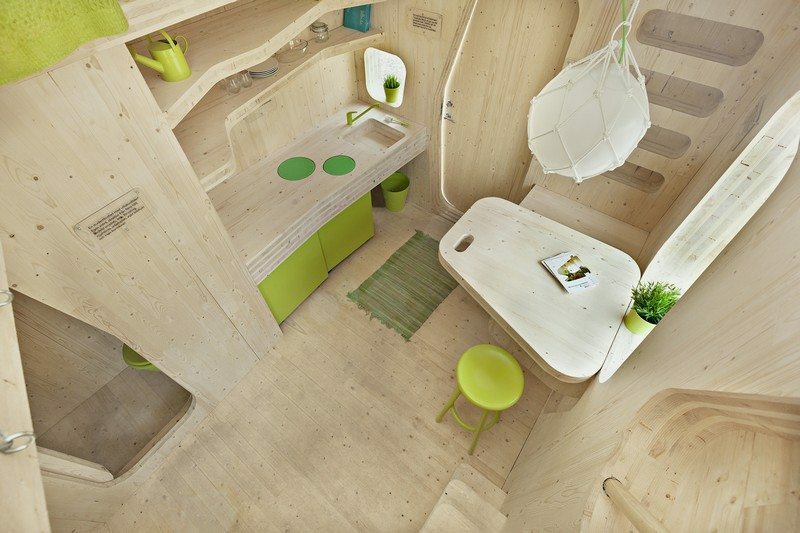 The ultra compact-living space still offers a comfortable sleeping-loft, kitchen, bathroom and even a small patio garden! The efficient layout and the use of cross laminated wood as the construction material allows both lower costs and for the ecological impact and carbon footprint to be minimised. Energy efficiency played a major role in the design so choosing right material and manufacturing methods was vital. Timber was chosen for its carbon positive qualities,and, as a renewable resource, it can be sourced locally to minimize transportation overheads. The prefabricated manufacturing system was chosen because of is flexibility and for its assembling technique which can be done on site to further reduce transport costs and construction time. Many of the components fold away in order to allow easy movement. For example, the table lifts up to act as a shutter while the table support simply folds back into the wall. To date, 22 of these units have been constructed. It’s not hard to see how this concept could fulfil other opportunities such as cabins, guest accommodation, a home office and even low cost housing for the homeless. What do you think?